On April 8th, 2019, I spent my last day of vacation at the Center for the History of Medicine thumbing an epistolary journey through the communications of surgeon Elliot C. Cutler, hoping to find information pertaining to the neurological activities resulting from Harvard’s manning of WWI Hospital Base No.5 . I was quickly detoured, however, from this duty of delight when in the course of my search I found the story behind one of Cutler’s great works: A festschrift for his beloved mentor, Harvey Cushing. Harvey Cushing was born April 8th, 1869 in Cleveland, OH—exactly 150 years from the day I was reading some of his correspondences with Cutler. Cushing received his undergraduate degree at Yale, his medical degree at Harvard, his resident training at Johns Hopkins under the surgeon William Halstead, and his education from his hero, William Osler. He was the first Surgeon-in-Chief of the Peter Bent Brigham Hospital, and one of the fathers of modern neurosurgery, as well as the academic father of countless chairs of surgery throughout the world. An eminent scientist, surgeon, artist, and author, his life is best captured in biographies of Michael Bliss and others, so I will not recount it here. 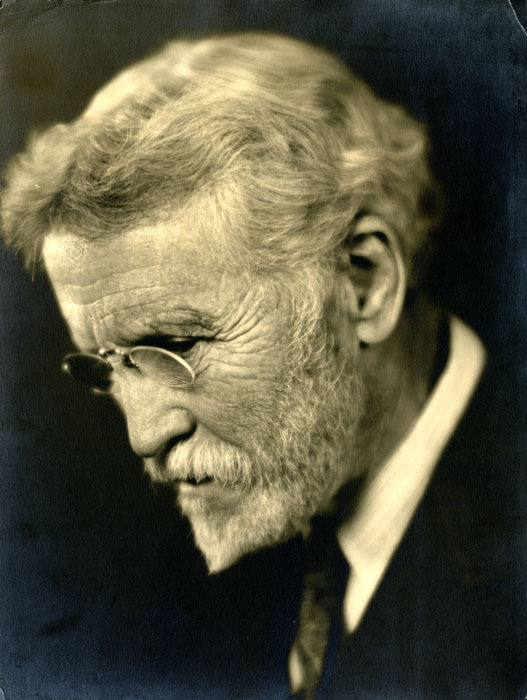 But, on the 150th anniversary of his birth, I will recount a fascinating personal foray of mine into a jubilee publication in dedication to him by Cutler, and in telling it, I aim to capture some of the of enthusiasm and appreciation for this great man. A festschrift is a celebratory publication in dedication to a figure at an important milestone in his or her life. Elliot Cutler’s idea of such a project occurred to him at the PBBH Decennial Celebration, just a few years before Harvey Cushing would turn 60 years old on April 8th, 1929. This is important because Cushing had been instrumental in a policy at the Brigham in which surgeons would retire at the age of 60. Cushing, fast approaching this deadline, refused to do so, and the conflict between Brigham and Cushing resulted in Cushing leaving Harvard for Yale and bringing with him all his slides, specimens, illustrations, and books. His shift in letterhead over the course of the festschrift materials reflected this. So the very idea of a celebration or memorial piece was already fraught with difficulty because of this sensitive issue. The festschrift was initially planned in secret, but The Chief was quick to ferret out Cutler’s thoughtful machinations about six months into the project, and admonished Cutler that “perhaps [Cutler] might get Williams and Wilkins to publish some of [Cushing’s] occasional addresses as a 60th tribute.” There may be more behind Cushing’s specific substitution. Osler was a hero and mentor to Cushing, and had himself produced a collection, Aequanimitas, containing some of his best occasional speeches. The impulse to follow in Osler’s footsteps and become more available to a lay audience as well as medical no doubt appealed to him. And his request would not go unheeded, as indeed in October 1928 The Atlantic Monthly would bring out a group of Cushing’s nontechnical essays. However, by the time Cushing heard of Cutler’s efforts, the momentum was not to be stopped. 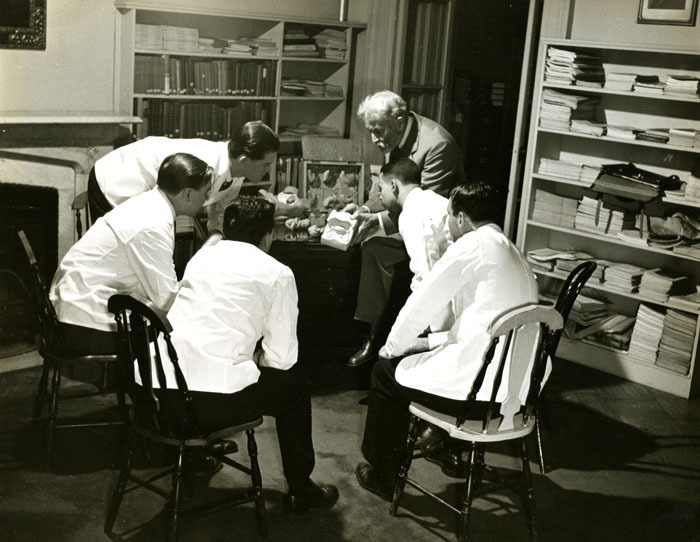 Six months earlier in January 1927, the festschrift was first proposed to Dean Lewis at Johns Hopkins, involved with the Archives of Surgery on behalf of its publisher, the American Medical Association. Cutler envisioned a festschrift unlike most in that it would be limited to Cushing’s pupils alone. “It is our intention that only his pupils join in this work,” Cutler wrote, ”we wish to emphasize the man as a great teacher, which in his own soul is the one great ambition of Cushing’s life.” Admirers and colleagues were to be excluded (or at least, attempted to be). To avoid a sense of entombing Cushing in a retirement or a rustication at Yale, Cutler’s festschrift would reside not as a shelved work, but within a living academic journal. Therefore, Cutler proposed a supplementary fasciculus accompanying the volumes of Archives of Surgery for an entire year, beginning January 1929. Perhaps there would be 50 contributors and maybe one-thousand pages total, he suggested. Like any good salesman, he stressed the serious contribution Cushing has made to surgery throughout the world, and how having such a fasciculus could pay for itself with the advertisements included, and how it would broaden the journal’s circulation with newly interested readers. Lewis replied favorably to the proposal, but suggested instead of serialization to have just one large fasciculus, and that the January deadline might be too hopeful, whereas rolling it back to April would place it nearer Cushing’s birthday. Lewis said, “I shall be very glad to receive your manuscript when you have it ready. You [Cutler] can edit the volume yourself, putting them in any way you wish, and take charge of it.” He also warned that the project would be expensive, and that Cutler and his informal committee, should be prepared to fund half of the expense. At the time the estimate was $1250. Cutler then began soliciting quietly for articles and for small donations, as he did not want The Chief to know of this effort (although as indicated above, within six months time Cushing was very much aware of this activity, and would make several intercessions to break up fights and fussing between bruised egos like William T. Bovie and A.J. McLean). The authorship read like a pantheon of surgical and pathological luminaries: Wilder Penfield, Stanley Cobb, Tracy Jackson Putnam, Walter Dandy, Arthur Earl Walker, to name a few. This list of Cushing’s disciples renovated every conceivable discipline, and here was their latest work bundled up as show of gratitude. This was itself a testament to Cushing’s influence. A bibliography and even a list of Cushing’s many accolades would not appear in the work—there simply was no room for it all. Cutler sent continual reminders to Lewis about the project, but never received an official confirmation of approval until June 4th, 1928, in which Lewis places Cutler in touch with Morris Fishbein the supervising official of the American Medical Association’s publications. For the next two years, Cutler and Fishbein would collaborate on this labor, often suffering the abuses of critical authors, at other times soothing egos between authors still vying for precedence, and shouldering various financial and production difficulties. Cutler’s festschrift and the primary literature surrounding it within the CMH archives is an education in the hazards of publication. It was decided the volume would not be a supplement, but would be a stand-alone volume. The articles would be arranged in chronological order not by discovery of the topic discussed, but in order of each author’s tutelage under Cushing. This was suggested cleverly by Fishbein, which Cutler recognized, as it “obviously place[d] your most important papers out front, and at the same time will not give offense to brilliant young pupils.” The dedication page vacillated between English and Latin translations (Cutler would consult the Ohio State University’s Latin department on the accuracy of his rendering), but eventually would be published with Latin dedication in a special, limited edition, and English for the general circulation: Chirugo clarissimo optimoque magistro (translated tersely as “Master Surgeon and Teacher”). Fishbein invited Cutler to send the manuscripts along as they were finished for proofing in order to avoid a log-jamming in February. This was wise because the authorship ballooned from a proposed 50 to over 80 contributors, and indeed the book was not finalized until the last possible moment, roughly ten days before its printing. Indeed, a telegram from Cutler to Fishbein read simply, “Where is the book? – Cutler” as late as April 2nd, 1929. Cushing could estimate the onerous task of monument-making, and in fact both Cutler and Fishbein suffered personally in disgruntled friends, sometimes neglected family duties, and postponed mourning of calamities (Fishbein’s son died of rheumatic fever shortly before the festschrift was published). Cutler’s own contribution to the work, an historical piece entitled, The Art of Surgery, offers the lapidary statement: Science teaches us to know, and an art to do. He wanted to relate surgery, a manual field of action for centuries looked down by ‘practitioners of physick,’ and remind his contemporaries of the powerful art that changed and saved lives every day, with Cushing at its zenith. The articles written by leading lights contained within the festschrift are a portfolio of sweat and work, not postulation and posturing. It was, therefore, a fitting tribute to Cushing, himself an artist with pen and scalpel equally adroit. I spent Cushing’s 150th birthday following the story of this jubilee festschrift stewarded by Cutler. Along the way there were many personalities, lovely phrases, course and quaint handwriting, but more than anything it was the little off-hand comments, asides, and jokes amongst friends and colleagues that sketched for me characters hitherto recognized as anything other than words on walls of wards. It is my hope that during this year we may consider our own history of our histories, and I choose to concentrate on Cushing. If science is to know, and art is to do, then history might be knowing how it was done. In return, the Foundation requests a one page report on the Fellow’s research experience, a copy of the final product (with the ability to post excerpts from the paper/project), and a photo and bio of the Fellow for web and newsletter announcements. The Fellow will also be asked to present a lecture at the Countway Library. Applicants should submit a proposal (no more than five pages) outlining the subject and objectives of the research project, length of residence, historical materials to be used, and a project budget (including travel, lodging, and research expenses), along with a curriculum vitae and two letters of recommendations by May 15, 2019. The fellowship proposal should demonstrate that the Countway Library has resources central to the research topic. Applications should be sent to: The Foundation for the History of Women in Medicine Fellowship, Archives for Women in Medicine, Francis A. Countway Library of Medicine, 10 Shattuck Street, Boston, MA 02115. Electronic submissions of applications and supporting materials and any questions may be directed to chm@hms.harvard.edu or (617) 432-2170. The Women in Medicine Legacy Foundation, formerly the Foundation for the History of Women in Medicine, was founded with the strong belief that understanding our history plays a powerful role in shaping our future. The resolute stand women took to establish their place in these fields propels our vision forward. We serve as stewards to the stories from the past, and take pride in sharing them with the women of today. Our mission is to preserve and promote the history of women in medicine and the medical sciences, and we look forward to connecting you to our collective legacy that will empower our future. The Archives for Women in Medicine is a program of the Countway Library’s Center for the History of Medicine at Harvard Medical School. The Archives for Women in Medicine actively acquires, processes, preserves, provides access to, and publicizes the papers of women physicians, researchers, and medical administrators. Learn more about collections open to research on our Archives for Women in Medicine Collections page. Established in 1960 as a result of an alliance between the Boston Medical Library and the Harvard Medical Library, the Francis A. Countway Library of Medicine is the largest academic medical library in the United States. The Countway Library maintains a collection of approximately 700,000 volumes. The Center for the History of Medicine’s collection of archives and manuscripts, numbering between 15-20 million items, is the largest collection of its kind in the United States. The manuscripts collection includes the personal and professional records of physicians from the medieval and Renaissance periods through the twentieth century, including the professional papers of many renowned Harvard faculty members as well as physicians and scientists from New England and around the country. The 2018-2019 Foundation for the History of Women in Medicine Research Fellow is Carla Bittel. Previous fellows include Maria Daxenbichler, Jordan Katz, Kate Grauvogel, Louella McCarthy, Rebecca Kluchin, Ciara Breathnach, Carrie Adkins, and Hilary Aquino. Sign up for a Spring Tour! Join us for one of the many tours the Center is offering this spring. Tours are free and open to the public, but registration is required. Leder, Philip, “Codons notebooks,” OnView: Digital Collections & Exhibits, accessed April 5, 2019, http://collections.countway. harvard.edu/onview/items/show/13021. The Center for the History of Medicine in the Countway Library is a hub of activity for the history of medicine and society in Boston’s Longwood Medical Area. Located on L2 of the Countway Library, the Center is home to over 2,790 manuscript collections and institutional records series, 1,256 gigabytes of migrated born digital records, 177,676 rare books and journals, and 15,768 Warren Anatomical Museum objects (including artifacts, anatomical, osteological and fluid preparations). Join Jessica Murphy, the Center’s Public Services Librarian, for an introduction to selections that are not only unique to Harvard, but inform and deepen our understanding of contemporary medicine. Register. 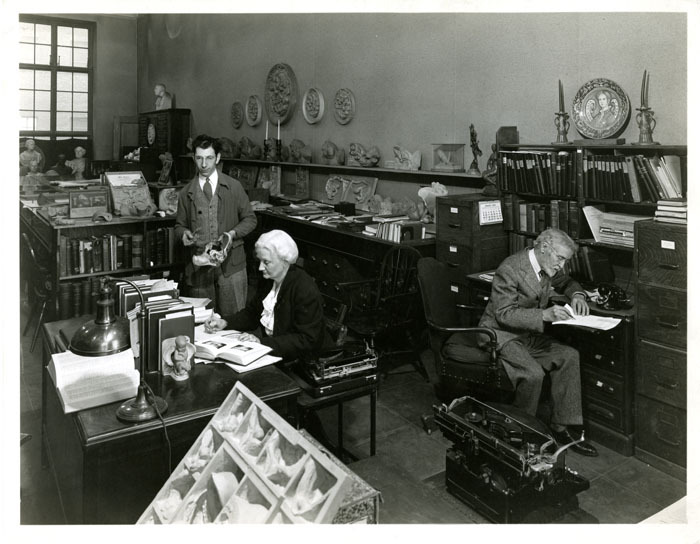 Join Heather Mumford, Archivist for the Harvard T.H. Chan School of Public Health, for an introduction to manuscript and archival collections that illustrate the rich and innovative history of the Chan School of Public Health. Selections from the Center’s historical collections will be on display as part of the tour. Register. Join Joan Ilacqua, Center for the History of Medicine’s Archivist for Diversity and Inclusion, for a history of those underrepresented in medicine at Harvard through the manuscript and archival collections held by the Countway Library. The tour will include a discussion of current collecting initiatives and a display of selections from the Center’s rich historical collections. Register. The Warren Anatomical Museum is one of the last surviving anatomy and pathology museum collections in the United States. 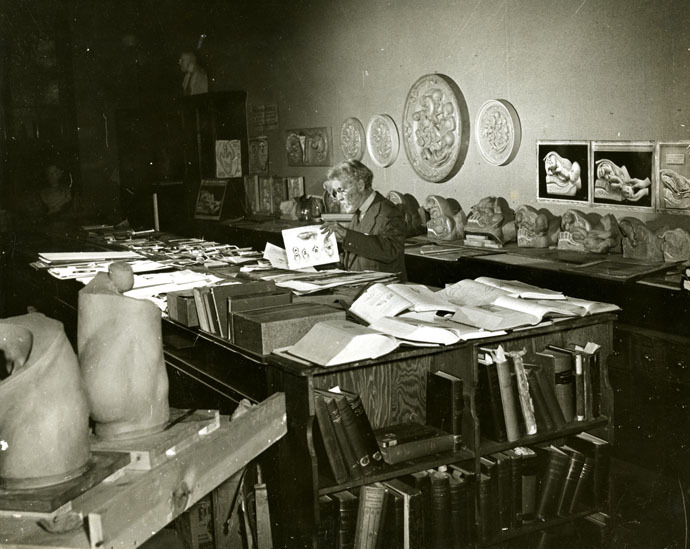 In 1847, Harvard anatomist and surgeon John Collins Warren founded the Museum to preserve and classify specimens and models needed for teaching. 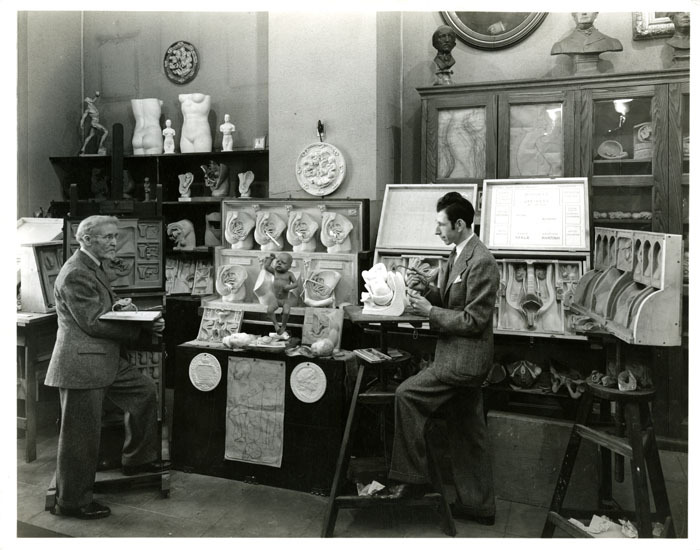 Until 1999, the Museum was in the Department of Anatomy and Cell Biology. 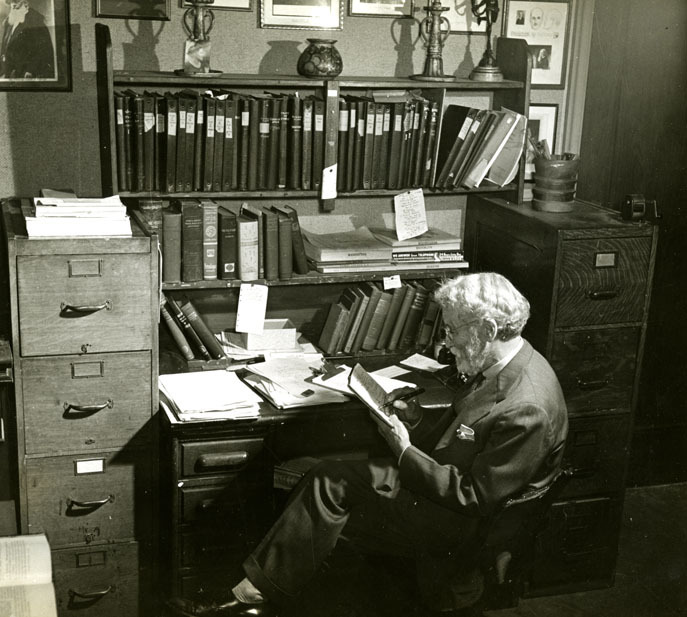 It is now an integral part of the Countway Library’s Center for the History of Medicine. Join Museum Curator Dominic Hall for a guided tour of the Museum holdings on exhibit in the Countway Library, including the skull, life cast, and tamping iron of Phineas Gage. Register. Technicians examining plates and tissue culture flasks at a laminar flow hood, 1986. Courtesy National Cancer Institute, National Institutes of Health (ID 2263). This change of perspective will be explored in the symposium, “Human Tissue Ethics in Anatomy, Past and Present: From Bodies to Tissues to Data.” An international group of scholars will discuss the ethical aspects of existing questions, explore the relevance of non-profit and for-profit body donation, and examine newly emerging technologies in anatomy that may need innovative ethical approaches. The aim of this symposium is to present evidence for the insight that transparent and ethical anatomical body and tissue procurement is indeed at the core of medical ethics in research and education. Image: Technicians examining plates and tissue culture flasks at a laminar flow hood, 1986. National Cancer Institute, National Institutes of Health (ID 2263, 1986). Portrait of Eleanor Dewey Mason, circa 1956. Image courtesy of the Schlesinger Library, Radcliffe Institute, Harvard University. As we prepare to celebrate International Women’s Day, it has been a pleasure to research and highlight Dr. Eleanor Mason, a student and visiting scientist at the Harvard School of Public Health, now known as the Harvard T.H. Chan School of Public Health. Dr. Eleanor Dewey Mason was born in Tura, Assam, India in 1898 to American Baptist missionary parents. After graduating from Newton High School, she earned her BA from Mt. Holyoke College (1919) and an MA from Wellesley College (1921). Her early interest was in zoology as well as missionary work, and after spending a year as a research assistant in genetics with the Carnegie Institute in New York City, she took advantage of an opportunity to become a zoology lecturer in India at Madras University. On her first furlough from Madras, she came to Boston to pursue an MA (1928) from Radcliffe College. Later, she returned to Radcliffe and earned her PhD (1934). These degrees from Radcliffe involved vital statistic courses taken at the Harvard School of Public Health (HSPH), as well as courses taken at Harvard Medical School (HMS). It is important to note that at this particular time, women took courses but could not receive degrees from HSPH or HMS. While the Harvard-MIT School for Health Officers (1913-1921) credentialed women on the same basis as men (with certificates in public health), this practice ended in 1921 with the withdrawal of MIT and an establishment of a Harvard degree-granting school of public health. Therefore, it isn’t surprising to see Dr. Mason listed in the 1927 HSPH course catalog as a vital statistics student, even though she is not considered a graduate of the program. In 1934 and 1940, Dr. Mason published on the basal metabolic rate of South Indian women in comparison to British and American women who travel from temperate to tropical climates. Her Western research subjects were colleagues who had also come to Madras to teach at the Women’s Christian College. Some of the women experienced a 10% drop in their metabolism as a result of the tropical climate, while others experienced no change at all. Dr. Mason’s results did show consistently that weight decreased and pulse rates fell in warmer climates, and that the basal metabolic rate of South Indian women was decidedly lower than that of British and American women. In 1942, her research focused more on nutrition in rat models, with the intention of demonstrating the inadequacies of the rice diet common among the poor in South India. A 1945 paper examined the supplementary effects of casein, calcium lactate and butter, singularly or combined, on the growth of young rats. Casein and calcium lactate were found to have a highly significant effect in promoting growth, while butter affected both growth and general condition adversely. Casein, when added to butter, counteracted the negative effect of butter and converted it into a positive effect (Mason 1945). In a 1946 paper, she and her team experimented further with ragi (a cereal crop also known as Eleusine coracana, or “finger millet”) and found that, when substituted for rice, it had a marked stimulating effect on growth directly proportional to the amount given. 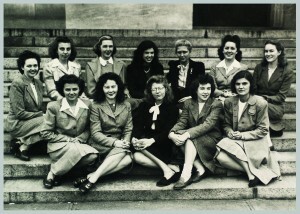 In addition to her physiological research in basal metabolism, and after years of teaching, in 1948 Dr. Mason became the third principal of the Women’s Christian College. In this role, she pioneered a home science courses for the students. In 1951, Mt. Holyoke College awarded her a honorary doctorate of science. In 1956, Dr. Mason retired from her role at Women’s Christian College and was invited by the University of Bombay to continue her research in the laboratory of Dr. A. Sreenivasan in the Department of Chemical Technology. She moved into the Missionary Settlement for University Women, an interdenominational hostel comprised of fifty-eight British and Indian colleagues. Dr. Mason’s laboratory was modest: a room with two beds and measuring equipment, and connected to her own bedroom. Research subjects would be asked to fast for twelve hours. Once they arrived at the lab, they were instructed to lie quietly on one of the research beds and breathe into a spirometer for three eight-minute stretches while Dr. Mason and her assistant Mary Jacob, from Travancore, measured pulse, blood pressure, and temperature. After a day’s work, Dr. Mason would spend her evenings at the missionary leading prayers with the other hostel residents. She stayed in the settlement until 1964, then spent several years as a member of the ecumenical Farncombe Community in England before returning permanently to the United States in 1970. It is clear from newspaper articles and from personal accounts that Dr. Mason returned to Boston to continue her involvement at the Harvard School of Public Health, likely as a researcher but also potentially as an educator. The Radcliffe Quarterly confirms that Dr. Mason was a visiting scientist at HSPH from 1963-1964. Contemporary faculty such as Joseph Brain and James Butler reflect fondly on their brief overlap with her at the school, including her involvement with physiology research and teaching, now considered part of the Department of Environmental Health. In addition to her career at Harvard, Dr. Mason was a member of the tertiary Anglican Franciscan group, Christa Prema Seva Sangha, of the Society of the Companions of the Holy Cross. In later life, she served as a communicant and a parish receptionist for the Church of the Advent. She was also part of Windham House, the Graduate Training Center for Women of the Episcopal Church, which was a center for women studying theology and other disciplines. Dr. Mason passed away in 1995 at the age of 97. Her body was donated to Harvard Medical School before being buried at Forest Hills Cemetery in Jamaica Plain. The archives of the Society of the Companions of the Holy Cross, located at Adelynrood in Byfield, MA. 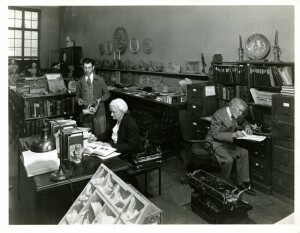 The Schlesinger Library, the official repository of Radcliffe College, hosts biographical information on Dr. Mason in her student file (RG XXI, Radcliffe College student files, Series 2, Student Files, 1927-1970, Box 559) and in her deceased alumnae file (RG IX, Radcliffe College. Alumnae Association, Series 2, Deceased Alumnae Folders, Box 213), all of which are open to research (but not made available in time for the publication of this blog post). I wish to thank Jim Butler, Senior Lecturer on Physiology, for sharing stories and resources about Dr. Eleanor Mason, and for connecting me to the archives at the Society of the Companions of the Holy Cross, whose secondary source materials served as the backbone of this post. Dr. Mason was a colleague as well as a dear friend of his family, and without his persistence her story likely would have remained dormant in the archives. I also would like to thank Dr. Joe Brain, Cecil K. and Philip Drinker Professor of Environmental Physiology, and Yechaan (Eric) Joo, a graduate student at the Harvard Chan School, for their research on Dr. Mason’s publications and her connection to the Department of Environmental Health. For a complete list of Dr. Mason’s publications, please visit the History of Public Health at Harvard LibGuide. The Center for the History of Medicine, Francis A. Countway Library of Medicine, is pleased to share information about the 15th Annual J. Worth Estes Lecture. To RSVP, please email the Boston Medical Library or contact Tara Peeler at 617-432-4807. Doug Dockery collecting outdoor air samples for the Harvard Six Cities Study. Image courtesy of the Harvard University Center for the Environment. Heather Mumford, Archivist for the Harvard T.H. Chan School of Public Health, has received funding from the Dean’s Office and the Department of Environmental Health at the Harvard Chan School to immediately begin a Harvard Six Cities Study Oral History Project. In the coming months, Mumford will work closely with those closest to the study, such as Douglas Dockery, Frank Speizer, Francine Laden, John Spengler, and Petros Koutrakis, to identify key topics and narratives for inclusion in the project. The resulting oral history interviews will be recorded, transcribed, and preserved for posterity at the Center for the History of Medicine. For more information about the project, please contact Heather Mumford. Apply Now for a 2019-2020 Boston Medical Library Fellowship! Since 2003, the Boston Medical Library (BML) in the Francis A. Countway Library of Medicine has sponsored annual fellowships supporting research in the history of medicine using Center for the History of Medicine collections. BML Fellowships in the History of Medicine at the Countway provide stipends of up to $5,000 to support travel, lodging, and incidental expenses for a flexible period between July 1, 2019 and June 30, 2020. Besides conducting research, the fellow will submit a report on the results of his/her residency and may be asked to present a seminar or lecture at the Countway Library. Engraving of an apothecary in Das Buch der Cirurgia (Strassburg, 4 July 1497). Boston Medical Library Rare Books Collection (Ballard 233). The collections of the Center for the History of Medicine enable researchers to contextualize, understand, and contribute to the history of human health care, scientific medical development, and public health; they eflect nearly every medical and public health discipline, including anatomy, anesthesiology, cardiology, dentistry, internal medicine, medical jurisprudence, neurology, obstetrics and gynecology, pharmacy and pharmacology, psychiatry and psychology, and surgery, as well as variety of popular medicine topics and public health subjects such as industrial hygiene, nutrition, and tropical medicine. The Center serves as the institutional archives for the Harvard Medical School, Harvard School of Dental Medicine, and the Harvard School of Public Health, and is home to the Warren Anatomical Museum, which includes anatomical artifacts, pathological specimens, instruments, and other objects. Through the Center, researchers have the opportunity to use the rich historical resources of both the Harvard Medical Library and Boston Medical Library. For more information, visit https://www.countway.harvard.edu/center-history-medicine/collections. Fellowship proposals (no more than 5 pages) should describe the research project and demonstrate that the Countway Library has resources central to the research topic. Application deadline is Friday, March 29th. Please see our website for more information and details about previous research recipients. Awards will be announced in early May. While processing the Robert Latou Dickinson papers, Center staff came across photographs of Robert Latou Dicksinon and artist Abram Belskie in their studio at the New York Academy of Medicine. 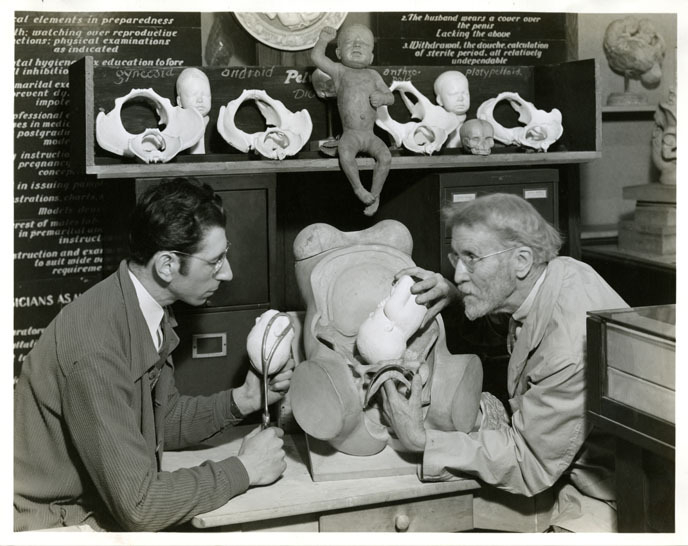 After retirement from medical practice, Dickinson collaborated with Belskie at the New York Academy of Medicine to create molds and models of human reproductive anatomy for display and as teaching aids, some of which were exhibited at World’s Fair in 1939. These models were later featured in the teaching book Birth Atlas. The sculptures Norma and Normman were a product of their collaboration as well. In 1945, Dickinson transferred his reproductive anatomy model collection to the Cleveland Health Museum. In 2007 the Health Museum was absorbed into the Cleveland Museum of Natural History and at that time transferred the Dickinson-Belskie collection to the Warren Anatomical Museum. 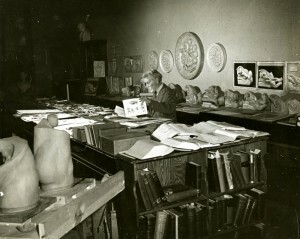 The Dickinson-Belskie Collection in the Warren Anatomical Museum (object numbers 20500-20778) is available for research. Advance notice is required. The finding aid for the Dickinson papers can be found here. For information regarding access to these collections, please contact the Public Services staff.